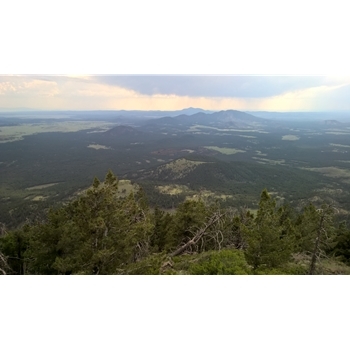 Located in north-west of Flagstaff, this predominant Mountain offers a challenging hike (2,580 ft gain) with some great rewarding views! Features and Interests: The 360 degree views of surrounding volcanos and mountains including San Francisco Peaks. Historical, century old Forest Service cabin sits on the prairie before the final peak ascent (allowing camping nearby). Trail Description This very scenic trail takes you steadily up the mountain via consistent switchbacks. From the parking lot, the trail starts fast, climbing steeply to the south. After a quarter mile, the trail becomes less steep and continues climbing past the wilderness boundary. Following the contour of the mountain, after a mile the road begins to switchback up the southwest face of the mountain. Due to the past fires and trail opening in several areas, you are constantly rewarded with outstanding views including the San Francisco Peaks. After another mile, the trail continues in direction of the lookout tower ahead. With a long series of switchbacks along the south side of the mountain, the views are deserving the climb. Just over 4 miles in, the trail reaches a saddle and a century old Forest Service Lookout Cabin. The Bull Basin Trail ends behind the cabin and sets up a fine area for campers. From the cabin, the lookout tower is about half a mile south, following short switchbacks up Kendrick Mountain. Along the way, you will cross a junction with the Pumpkin Trail. When you reach the Forest Service lookout tower, you will see everything that is northern Arizona, including the North Rim of the Grand Canyon, Red Mountain, San Francisco Peaks and Sycamore Canyon. Once you regain your breath, follow the same route back down to the trailhead. Accomodations: (on site) Toilets Camping Directions: From Flagstaff, take the US 180 northwest to mile marker 230. Turn west on FR 245 and follow it to its end at FR 171 (3.6 miles). Turn right and go north on FR 171 for 3.1 miles to FR 190. Turn right following the markers to the trailhead. Accessibility: Good dirt road with rough patches, off-road vehicle recommended.